Help Brand-Shei uncover his past. Find Lymdrenn Tenvanni's Journal in Wreck of The Pride of Tel Vos. Take the journal to Brand-Shei. Brand-Shei is a Dunmer trader in Riften. He can usually be found at his stall at the market, or in a cell in the Riften Jail if you've helped Brynjolf frame him for theft. As a Dunmer, he has an oddly Argonian name (such as Beem-Ja, Gulum-Ei, Talen-Jei). In fact, he was raised Argonian. "I ended up orphaned then taken in by a kindly Argonian family in Black Marsh." He hopes one day to find out what happened to him and he has got one clue. When he was found by his Argonian father, he was wrapped in a blanket bearing the symbol of House Telvanni, one of the great houses in Morrowind long ago. He'd like you to keep an eye on anything that might provide him with the answers he is looking for in your travels. If you ask him why was he searching in Skyrim, he will tell you something about a matron who had served for House Telvanni and remind you to investigate a ship named "The Pride of Tel Vos". Travel to the northeast coast of Skyrim and you can find the wreck of The Pride of Tel Vos. A group of three bandits have a camp here. However, you can hide yourself from them easily. You can also choose to wipe them out and take their treasures. 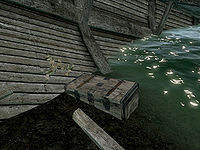 In the northern half of the ship at the waterline, you can find a waterlogged chest containing the item you need: Lymdrenn Tenvanni's Journal. This journal would be the key to the answers Brand-Shei is looking for. Return to Brand-Shei and give the book to him. He will be very excited. "Yes... yes. This is it! I don't know how you found this stranger, but you've obviously succeeded where I had failed." Then he will offer you the key to his strongbox under his stand in the marketplace. You are free to take anything inside, including some gems, potions, and a random novice level Destruction spell tome. This quest can be completed by finding the journal in the wreck first, and then going talking to Brand-Shei afterwards. You'll get the key to his strongbox. The contents are low leveled, and if you don't have Prowler's Profit, then you'll get nothing of real value. After completion of this quest, some items in Haelga's Bunkhouse will be free to take, as this is Brand-Shei's residence at the start of the game. Brand-Shei's journal may not appear in the chest, even when the quest marker points to it. ? This can be fixed using the console command setstage FreeFormRiften08 30. The following empty quest stages were omitted from the table: 0, 10, 200, 250. On the PC, it is possible to use the console to advance through the quest by entering setstage FreeformRiften08 stage, where stage is the number of the stage you wish to complete. It is not possible to un-complete (i.e. go back) quest stages, but it is possible to clear all stages of the quest using resetquest FreeformRiften08. Esta página foi modificada pela última vez à(s) 14h19min de 12 de março de 2016.